4Noah accessible gaming utilities are aimed at reducing the number of controls needed to play PC games. 4Noah utilities, written by William Pilgrim, are PC software modules that reduce the number of controls needed to play a game. For example, with 4Noah Lite, you can take control over two controls such as LEFT and RIGHT alternately using a single button. In this way a gamer using a single accessibility switch can be given more power to play otherwise inaccessible games. Take a look at the video clip below of Space Invaders being played using the full 4Noah utility. LEFT and RIGHT movement of the base cannon is being controlled via a single accessibility switch with automatic firing locked on. This shows how a game that normally requires three buttons, can be played with just one. Take a look at the 4Noah YouTube Channel for more examples. 4Noah Lite is one of the simplest 4Noah utilities. It allows a single control (the SPACE BAR or LEFT MOUSE CLICK) to toggle a 'virtual joystick' between left and right (outputting a 4 or 6 from the Numeric Keypad or an A or a D with the alternative version). You will thus need to find a game where you can redefine the keys. Almost all emulated games allow you to do this, such as with MAME. The following should help get you started. Download and unzip the 4Noah Lite utility. If you are using an accessibility switch, ensure it is set to trigger the SPACE BAR or the LEFT MOUSE BUTTON. To make a quick test to see if all is working correctly, open up a Notepad window and type a load of text on the screen (Word would be fine too). Start 4Noah Lite by double clicking on its icon. You should quickly be able to move the cursor left and right by pressing the SPACE BAR. Close this window down then press ESCAPE to get back to the Front End. Find a game you wish to play, then redefine the keys so that 'Numeric Keypad 4' is accepted as move left and 'Numeric Keypad 6' is accepted as move right. You can do this in MAME by pressing the TAB key to bring up the key configuration screen. Use the cursor keys and RETURN to select a control to adjust, then press your chosen key. Use the ESCAPE key to clear any unwanted highlighted selections. At this stage 4Noah Lite will not output any virtual key presses through the virtual joystick. This gives you a chance to set up your game. Press SPACE or LEFT CLICK to start. 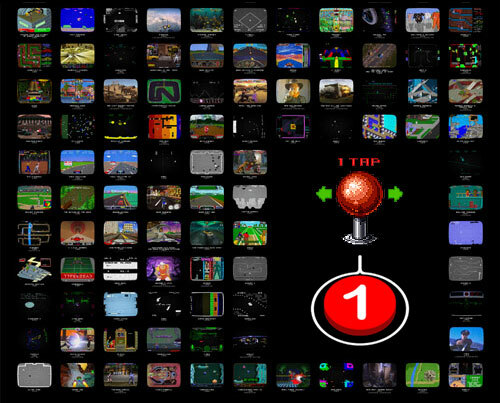 'Numeric Keypad 4' (on-screen joystick left) - nothing - 'Numeric Keypad 6' (on-screen joystick right) - nothing (repeating until any of the following are pressed). 'P' = Pause 4Noah Lite. 'ESCAPE' = reset back to the Front Menu. N.B.Although it is easiest to play games that run within a window enabling you to see the 4Noah window simultaneously - it is also possible to play games full screen. To do this you must minimise the 4Noah window (a small icon should appear in the bottom right tool bar tray) to avoid problems such as flickering. Game too fast? You may find it very useful to be able to slow your game down. Using an extra utility such as CPUKiller may help you here. MAME itself has a facility to slow some games down further without affecting the performance of your PC. 4Noah is the creation of William Pilgrim from 2007 to date assisted and hosted by OneSwitch.org.uk.